You have seen it in rustic paintings or perhaps along a country back road: The old mill with its wheel turning steadily, primed by water from a rapidly-flowing stream. The turning of the wheel means there is power being sent to the inner workings of the mill, and all the parts are functioning as they should. It is a comforting image, and it is one that relates directly to a healthy human body and our need for consistent water intake. More than 70 percent of the human body is made up of water. Because every system in the body depends on water, there is a real need for constant hydration. If these bodily needs are not met, the risks of dehydration increase. Dehydration occurs when there is not enough water in one’s body to carry out natural organ functions. This is especially important in flushing harmful toxins from one’s body and transporting healthy nutrients throughout. Water is largely lost through perspiration, urination, bowel movements and even breathing. Thus, eating foods and drinking liquids that contain water are vital to normal functioning of a healthy body. 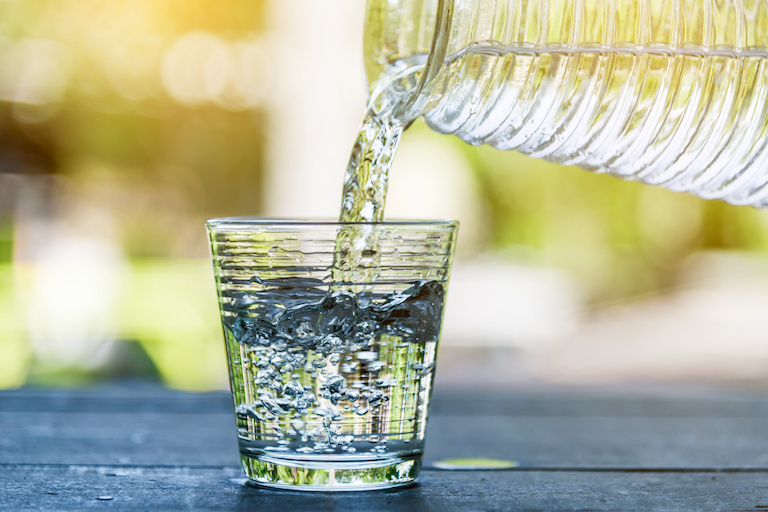 Though dehydration can happen to anyone, seniors are especially at risk – for them, dehydration is a main cause for hospitalization. This approach suggests consuming two liters of water per day to replace water lost through sweating, urination, bowel movements and breathing. This method, when combined with the normal diet and food-water intake, will replace the amount of water lost daily. Known as the “8 x 8 rule,” many follow this guideline to proportion water intake. This approach results in drinking approximately 1.9 liters of water each day. The Institute of Medicine created a standard for the average man and woman’s daily liquid intake. Men are advised to consume three liters (13 cups) of beverages per day, while women should drink 2.2 liters (9 cups) of liquid daily. These liquids should be water-based or healthy drinks. An easy way for seniors and their caregivers to be actively conscious of dehydration risks is to measure weight daily. If weight loss is two percent, dehydration is mild. However, if there is a five percent weight loss, this could be a result of severe dehydration. Medical attention should be sought if this occurs or if there is noticeable irregularity in hydration levels. In order for an individual to sustain proper hydration, follow one of these tips. Monitor the regularity of urination patterns. A colorless or light-yellow urine tint is a sign of a properly hydrated body. Ensure that the amount of liquids exiting the body is equally being replaced by clean, fresh water. It’s like watching the mill’s waterwheel. Water has to keep moving for all the parts to work.